Glenstone houses the contemporary art collection of founders Mitchell and Emily Wei Rales, who wanted to create a museum experience that integrates art, architecture, and landscape. My greatest hope is that [Glenstone] will be perceived as one of the paramount art destinations in the world. . . . I am going to work as hard as I can to create something that you will not see anywhere else, and then I will open the gates so that everyone can enjoy it. Born in 1956, Mitchell Rales grew up in Bethesda, Maryland, one of four sons of Norman and Ruth Rales. During his childhood, Rales was not particularly exposed to art.“Bloomberg Billionaires Index – Mitchell Rales,” Bloomberg.com, January 1, 2016, https://www.bloomberg.com/billionaires/profiles/mitchell-p-rales/. However, he was witness to both entrepreneurship and philanthropy: Norman Rales founded the Mid South Building Supply Company—a distributor of home improvement products in Washington, D.C.—and established the Norman and Ruth Rales Foundation and the Ruth Rales Jewish Family Service in 1979.“A Message From the Employee Owners,” Mid South Building Supply, accessed January 15, 2018. http://www.msbs.net/AboutUs.aspx and Lisa J. Huriash, “Norman Rales, Philanthropist, Died,” Sun Sentinal, March 15, 2012, http://articles.sun-sentinel.com/2012-03-15/news/fl-norman-rales-obit-20120315_1_norman-rales-orphanage-group-homes. Mitchell Rales graduated in 1978 with a degree in business administration from Miami University in Oxford, Ohio.“Bloomberg Billionaires Index.” With his brother Steven, he cofounded the Danaher Corporation, a Fortune 500 company focused on industrial and consumer products, and, in 1995, they founded Colfax Corporation, a global manufacturing and engineering company.Helia Ebrahimi, “Colfax and the Rales Brothers,” Telegraph, September 5, 2011, http://www.telegraph.co.uk/finance/newsbysector/industry/engineering/8742092/Colfax-and-the-Rales-brothers.html. In 1986, Rales purchased 230 acres of land in Potomac, Maryland, twelve miles from Rales’s hometown of Bethesda. The estate had formerly been used by the Potomac Hunt Club as fox-hunting grounds. In 1988, Rales and his first wife, Lyn Goldthorp Rales, built an English country estate–style house on the property.Stephanie Rachum et al., Glenstone: The Inaugural Exhibition, September 2005–December 2008 (Potomac, Md. : Glenstone Foundation, 2008), 19. Rales first developed an interest in art in 1990, when he decided to fill the walls of his newly finished house with paintings. After studying early modern art and acquiring works by Mary Cassatt, Henri Matisse, and Pablo Picasso, Rales was eager to search for other artworks that would inspire him, visiting museums and gallery exhibitions to increase his knowledge of art. He became interested in Abstract Expressionism, finding a personal connection to the period’s spirit of spontaneity and deviation from formalist rules, feeling that these traits also characterized his business style.Rachum et al., Glenstone: The Inaugural Exhibition, 14. The American postwar art dealer Robert Mnuchin was key in helping Rales develop his collection. Rales and Mnuchin collaborated on a “hit list” of works they wanted to find and purchase, with the goal of thoroughly profiling specific artists. In some cases, they sought to collect multiple works to represent an artist’s career in depth; in others, they sought to acquire only one important work by an artist that they felt was representative of that person’s career.Rachum et al., Glenstone: The Inaugural Exhibition, 15. 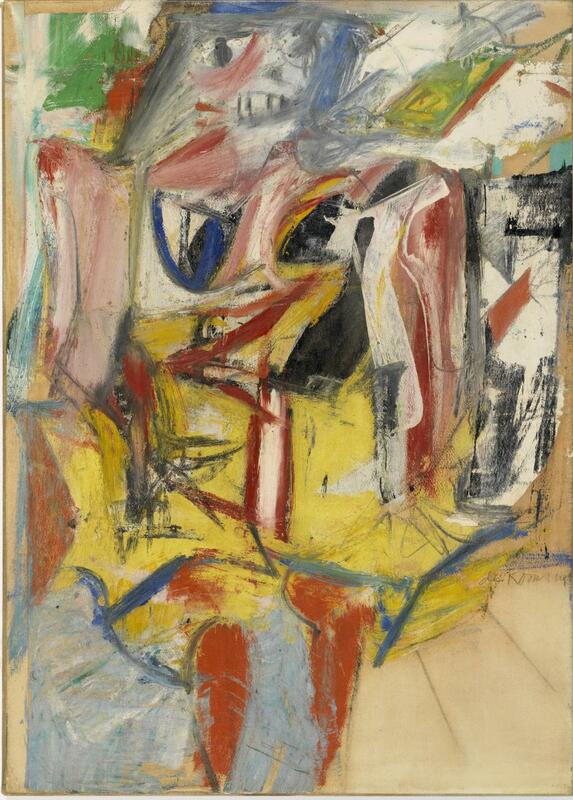 Willem de Kooning, Woman, 1953. Photograph courtesy of Glenstone. Rales was guided by these goals when he began to collect in earnest in 1992, initially targeting artworks by Willem de Kooning and Jackson Pollock. He soon developed a strategy to collect post–Second World War art that represented historical shifts in the continuum of modern art. To that end, he committed to two parameters when acquiring art: he only collected works by midcareer artists with at least fifteen years of prior exhibition experience, and he focused on abstract and conceptual art.Elisa Lipsky-Karasz, “The Most Influential Art Collectors You’ve Never Heard Of,” Wall Street Journal, November 29, 2017, https://www.wsj.com/articles/a-world-class-art-collection-expands-its-home-1511953200. By the late 1990s, Rales had acquired an important private modern art collection. Jackson Pollock, Frieze, 1953–1955. Photograph courtesy of Glenstone. In 1998, Rales narrowly escaped death while on a trip near Murmansk, Russia, when his chartered helicopter exploded during a refueling stop. He returned from the trip wondering, in his words, “I am alive. What do I do with my aliveness?” He soon recognized that “other than [his] family and loved ones, art made [him] feel more alive than anything else,” and decided to create a legacy through art. The conception of Glenstone came when he imagined “a tranquil place where, when you came through the gates, you forgot about whatever burdens you were carrying.”Lipsky-Karasz, “Most Influential Art Collectors.” He set about transforming his Potomac home into that place. Between 1998 and 2003, Rales completed his primary collection of Abstract Expressionist art and continued to develop plans for Glenstone. He wanted a building for his art that would distinguish itself from other museums.Rachum et al., Glenstone: The Inaugural Exhibition, 17. In 2001, Rales hired architect Charles Gwathmey, of Gwathmey Siegel & Associates Architects, whom he trusted to “let the art live and breathe.”Rachum et al., Glenstone: The Inaugural Exhibition, 17–18. Rales believed that each visitor needed thirty square feet of space to themselves in order to look at art comfortably.Vogel, “Like Half the National Gallery.” Art historian Emily Wei, who was the former director at Barbara Gladstone’s New York gallery and who later married Rales in 2008, encouraged him to expand his collection to include more contemporary art.Lipsky-Karasz, “Most Influential Art Collectors.” He acquired outdoor sculptures, including Tony Smith’s Smug and Richard Serra’s Sylvester, which he felt would further integrate art, architecture, and landscape at the museum.Rachum et al., Glenstone: The Inaugural Exhibition, 19–20. He also expanded his collection to include Minimalist works by artists such as Cy Twombly, Donald Judd, and Brice Marden.Lipsky-Karasz, “Most Influential Art Collectors.” Glenstone was inaugurated on September 30, 2006, as Rales’s “gift to humanity.”Rachum et al., Glenstone: The Inaugural Exhibition, 21. Emily Wei Rales became the museum’s director and has overseen acquisitions, curated exhibitions, and developed the museum’s public programs and social media campaign.Michael Shnayerson, “Inside the Private Museums of Billionaire Art Collectors,” Town & Country, October 8, 2017, http://www.townandcountrymag.com/leisure/arts-and-culture/a9124/private-museums-of-billionaires/ and Emily Grebenstein, interview by Chris Chow, January 12, 2018. Richard Serra, Sylvester, 2001. Photograph courtesy of Glenstone. Mitchell Rales decided against naming the museum after himself, instead naming it after Glen Road, where the estate is located, and after a type of carderock that is indigenous to the region.“Message From the Founders,” Glenstone, accessed January 14, 2018, http://www.glenstone.org/about. The new museum faced criticism for its limited access policy, which allowed visits only by appointment.Between 2006 and 2013, Glenstone maintained a limited access policy, allowing visits only by appointment. The museum is currently open four days a week, although visitors must make timed reservations, and there are plans for the museum to be open five days a week. Admission is free. See Shnayerson, “Inside the Private Museums.” Glenstone also became a part of the contemporary debate over tax deductions that individuals receive when they establish museums or otherwise contribute to philanthropic causes.Kriston Capps, “Congress Wants To Know If Two D.C.-Area Museums Are Actually Museums.” Washington City Paper, December 21, 2015, https://www.washingtoncitypaper.com/arts/blog/13082597/congress-wants-to-know-if-two-d-c-area-museums-are-actually-museums. Since opening in 2006, the museum has developed rotating solo exhibitions of contemporary artists that focus on the “critical moments in an artist’s career.”“Message From the Founders,” Glenstone. The art in these exhibitions comes exclusively from the Raleses’ collection. With the completion of the Pavilions in late 2018, an additional 50,000 square feet of “gallery room” pavilions, designed by Thomas Phifer and Partners, will showcase single‐artist, long-term installations of the art of Charles Ray, Brice Marden, Martin Puryear, On Kawara, Cy Twombly, and Michael Heizer, among others. There also will be galleries for changing exhibitions. The new facility will include 30,000 square feet of art storage space, office space, a cafe building, a bookstore, and an arrival gallery. The firm of Peter Walker and Partners Landscape Architecture will design parking groves and incorporate additional monumental outdoor sculptures and 6,000 new trees in the plan. With the new space, Glenstone will be able to accommodate about 100,000 visitors annually.Sarah Cascone, “A Frick for the 21st Century? Glenstone Is About to Become One of America's Largest Private Museums,” Artnet News, December 4, 2017, https://news.artnet.com/art-world/mitchell-emily-rales-unveil-major-glenstone-museum-expansion-late-2018-1163933. Alongside this expansion, which began in 2017, Glenstone launched its Emerging Professionals Program. The program accepts recent bachelor’s and master’s degree graduates interested in the museum field. Although open to all graduates, Glenstone currently is recruiting students from Washington D.C.-area universities, including Georgetown University, Howard University, and the Maryland Institute College of Art.“Glenstone Museum’s Two-Year Emerging Professionals Program Offers Opportunities for Hands-On Experience and Career Development for Early Career Museum Professionals,” Glenstone, last updated December 19, 2017, http://www.glenstone.org/ckfinder/userfiles/files/FINAL%20June%2012%20Glenstone%20Museum%20Emerging%20Professionals%20Program%20Release%20EG.pdf. The guides, as the emerging professionals are called, are trained across all Glenstone museum departments through projects and assignments, lectures and seminars with museum professionals, and work experience as guides. Through this program, Glenstone intends to develop new models in museum studies education and visitor experience; in particular, the guides are charged with facilitating intimate experiences for museum visitors through impromptu conversations about the art. Additionally, Glenstone provides interdisciplinary education opportunities for middle and high school students. The museum funds on-site field trips, providing bus transportation and substitute teacher reimbursements for all Montgomery County public school visits.Grebenstein, interview by Chow. Peter Walker, PWP Landscape Architects, Landscape 1, 2005. View of Meadow with Richard Serra’s Contour 290, 2004. Photograph courtesy of Glenstone. Glenstone remains largely an enterprise centered on the founders, with Mitchell and Emily Wei Rales closely overseeing all museum functions, including acquisitions and exhibitions.Grebenstein, interview by Chow. The museum is funded by Mitchell Rales’s Glenstone Foundation with an endowment of $1.25 billion,Cascone, “Frick for the 21st Century?” which Rales hopes will continue his vision “for eternity.”Rachum et al., Glenstone: The Inaugural Exhibition, 21. The founders have indicated that, after their deaths, the museum should acquire work by artists already represented in their collection. In an interview for Glenstone’s inaugural exhibition, Mitchell Rales described his vision for the museum, stating that his “greatest hope is that it will be perceived as one of the paramount art destinations in the world. . . . The pledge I made at the opening, which will remain my intention until I leave this earth, was that I am going to work as hard as I can to create something that you will not see anywhere else, and then I will open the gates so that everyone can enjoy it.”Rachum et al., Glenstone: The Inaugural Exhibition, 21. Profile by Chris Chow, 2018 Wintersession student, and Faye Yan Zhang, 2017–2018 Dumbarton Oaks Humanities Fellow.